Archos 5 Internet Tablet review | What Hi-Fi? The Archos has a decently big screen, at 4.8 inches. At its heart lies an 800mHz processor plus Google's Android operating system, and its graphics look superb. However, Android doesn't work as smoothly as we'd like: you're often left waiting for the player to switch menus or open the relevant files. Still, wi-fi internet browsing is straightforward enough. 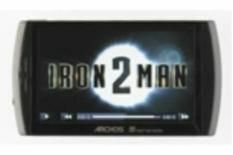 The Archos's media-player capabilities can be further enhanced, but only at extra cost. The DVR station add-on (£102) allows you to watch and record digital TV, while £12.50 spent on Archos's Cinema HiDef plug-in lets you output WMV (Windows Media Video) HD files in 720p at 24fps. Nice – but they'd be even nicer if they came as part of the package. Sonically, the Archos produces a detailed and vibrant sound. You don't quite get all the subtleties contained in a track, but it's a good effort all the same. However, despite its 800x400 screen, colours look unnatural and there's no real vibrancy to them. Blacks also appear slightly washed out. The Archos 5 Internet Tablet is glitzy, glamorous and well-featured. However, it isn't without issues, so it misses out on five stars.